NASA's planet-hunting Kepler spacecraft has observed brightness oscillations in more than 500 sun-like stars. The white-line grids represent the field of view on the sky of the Kepler detectors. NASA's planet-hunting Kepler space observatory has turned out to be a jack-of-all-trades — a multipurpose spacecraft that has gone beyond its alien world mandate to tackle some key star mysteries. In a pair of new studies, astronomers announced discoveries gleaned from Kepler measurements of distant starlight. In one report, researchers detected minuscule brightness oscillations in 500 sunlike stars — work that could help lay the foundation for a more robust understanding of star composition and evolution, according to the research team. In the other study, a different team characterized a strange, three-star system that undergoes two different types of eclipses. "Although already impressive, these observations represent only the tip of the iceberg of what we will learn through continued observation with Kepler and other ground- and space-based telescopes," he said. The research is detailed in the April 8 edition of Science. Since its March 2009 launch, Kepler has detected 1,235 candidate alien planets that await confirmation by ground-based instruments. But many stars — including our own sun — have their own periodic brightness variations, tied to the churning of their insides. These "starquake" oscillations can be exceedingly slight, often on the order of a few parts per million difference. Kepler's eagle eyes, however, can pick them up — and scientists can use the measurements to learn about the stars' structure and evolution, much as geologists use earthquakes to probe our planet's interior. The technique is known as asteroseismology. Using data from Kepler's first seven months of observations, researchers measured oscillations in 500 sunlike stars. Before their study, astronomers had such data on just 25 solar-type stars. The increase in sample size could open a lot of doors for astronomers, researchers said. "The size of this seismic 'ensemble' is large enough to allow us to do proper statistical studies, looking for trends in behavior that it is just not possible to do with small samples of stars," said lead author William Chaplin, of the University of Birmingham in the United Kingdom. In the study, Chaplin and his team provided an example of the power of their new dataset. They calculated sizes and masses for the 500 stars based on the Kepler asteroseismology observations, then compared those with numbers generated by computer models. The team found that the radii matched up — but the Kepler data suggests that the stars are less massive than models predict. So those models may need to be revised, Chaplin said. The new asteroseismology dataset will also allow astronomers to probe the interiors of sunlike stars, yielding a more complete understanding of their structure and evolution. And the Kepler observations could also help researchers learn more about the sun and how it may change in the future, according to Chaplin. "It is no understatement to say that this is a step-change of potentially dramatic importance for stellar physics, in that it puts us in a position to do things we couldn't do before," Chaplin told SPACE.com in an email interview. Artist's impression comparing the approximate sizes and colors of the stars in the triple system HD 181068. In the other study, researchers led by Aliz Derekas of Eotvos University in Hungary used Kepler to learn more about a strange three-star system known as HD 181068, which is about 815 light-years from Earth. This system, Kepler observations helped reveal, is composed of a red giant "primary" star (A) and two smaller red dwarfs that orbit it (B and C) and each other. B and C take about 45 days to circle A, but they whip around each other once every 0.9 days. Derekas and his colleagues found that HD 181068 is unique among known star systems in that it has two different kinds of eclipses, as seen from Kepler's perspective. B and C eclipse each other — as do A and the BC pair. These odd characteristics could help astronomers better understand stars and their orbits, according to Montgomery. "The eclipses provide constraints on the geometry of the system, which can then be used to test stellar models," Montgomery wrote in his article in Science. "In addition, continued observations will allow dynamical models of the evolution of the stellar orbits to be tested." Oddly enough, Kepler didn't pick up any of the expected sunlike brightness oscillations coming from the primary star in HD 181068. 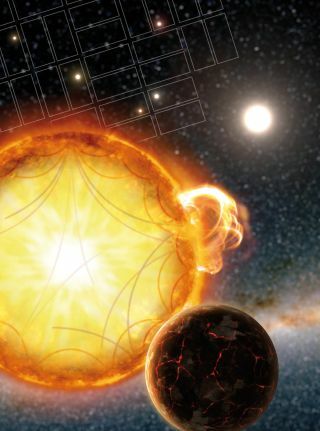 The orbital dynamics of the system may be suppressing these variations, researchers said.